George Graham Reviews Lee Ritenour's "6 String Theory"
The popularity and ubiquity of the guitar as an instrument has made for a good sized audience for guitar-intensive recordings. There are a lot of rock guitar heroes who attract fans from casual listeners to intense guitar-heads. Rock-oriented guitarists who release solo recordings tend to like to keep the spotlight on themselves. After all, they are supposed to be solo albums from a guitarist who may otherwise be part of a band. This week we have an interesting recording that goes in quite the opposite direction -- it's a kind of ultimate guitar cooperative recording, in which the leader sometimes does not even appear on some tracks. It's from veteran rock, jazz and fusion guitarist Lee Ritenour, called 6 String Theory. Fifty-eight-year-old Los Angeles native Lee Ritenour began his career at age 16, playing on a recording session with the Mamas and the Papas. He soon became a busy studio musician, and released his first solo album in 1976. Given the nickname "Captain Fingers" for his fretwork dexterity, he came to epitomize the Los Angeles light-fusion influenced sound that was often used to accompany singer-songwriters of the day. His own early recordings ran toward jazz-rock fusion and some funk, but his long recording career also has included his pioneering some guitar synthesizers and doing straight jazz recordings. For his latest project, Ritenour had the idea of collaborating with as many guitarists as possible. Some were old friends, some he admired from afar, there are a couple of emerging artists and even one who won a talent competition specifically for the album. 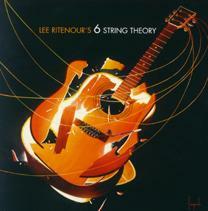 The title of the CD 6 String Theory, refers not only to the number of strings on a standard guitar, but to six so-called "strings" of guitar music as Ritenour sees it: jazz, rock, blues, acoustic, country and classical, and all are represented on the recording. Remarkable is the fact that the guitar-playing guests on the CD number 20 in all, ranging from BB King at age 84, to a 16-year-old Canadian classical guitarist named Shon Boublil. While there are a couple of tracks that feature just one guitarist at a time, most of the 15 selections on this generous 68-minute CD feature combinations of guitar players, sometimes stylistically similar, such as a pairings of rock, blues and fusion guitarists, and sometimes unexpected combinations like B.B. King with country artist Vince Gill. This is definitely a kind of dream album for guitar-heads, with some impressive and occasionally flashy playing. The detailed liner notes list all the equipment used by the 20 guitarists. But it's also a nice combination of sounds for those who might not be so intensively into guitars. Most of the recording is instrumental, as one might expect from a guitar aficionado CD, but there are some interesting combinations of people doing vocals, notably some of the better-known names such as B.B. King, Robert Cray, Vince Gill, Taj Mahal and others. It's observed in the liner notes that in these days of computer-based recording, frequently guest artists record their parts separately and present them as audio files to be combined in the digital mix, without ever having met. But except for just a couple of instances, the guitarist guests on 6 String Theory played their parts in the studio together -- the studio used was the famous former A&M studios in Hollywood. The supporting musicians vary from track to track, but many are first-call studio players like Ritenour himself such as keyboard man Larry Goldings, drummers Harvey Mason and Vinnie Coliuta, and bassist Nathan East. There there are lots of other interesting performance on the CD, such as jazz guitarist George Benson in a solo setting, and a fusion piece with Mike Stern, Ritenour and Japanese guitarist Tomoyasu Hotei. Lee Ritenour's 6 String Thoery is an ambitious and in many ways gracious project allowing the spotlight to fall on other guitarists Ritenour has admired. Ritenour says one of his inspirations for doing the CD is his fiftieth anniversary of taking up the guitar. It's all first-rate, and there is very little overt exhibitionism for its own sake. Putting diverse players together on a single tune was a catalyst for some nice interaction and in a way, it can show where their respective influences came from. Our grade for audio quality is about an A-minus. The general sound is nice and clean without excessive studio effects, but mindless compression in mixing and mastering robbed the music of dynamic range. If you are a guitar player or a guitar-head in general, this is perhaps the ultimate album to come out in recent years. But it's also a very appealing recording that covers a lot of styles tastefully. Lee Ritenour is a fine player in his own right, and on this CD he proves to be a great producer and musical facilitator.